We all have silly little fleeting thoughts that might not have much value, but at the time they seem to be a good idea. It’s hard to judge the actual worth of those concepts right then and there, and it’s a battle to remember them long enough to look back at. This is a problem that Evernote has been solving since 2008. An idea archiver and note taking app, Evernote lets users hold on to every last thought that crosses their mind – even the ones that have little to no merit. The iOS version, Evernote 5.0, just got an overhaul that aims to make it even easier to store things that you will look at later and shamefully delete before anyone else can see it. The previous layout of Evernote clearly served its owners well as the app amassed 34 million users over the years. That said, even the best options out there need a little refresher to stay on top. 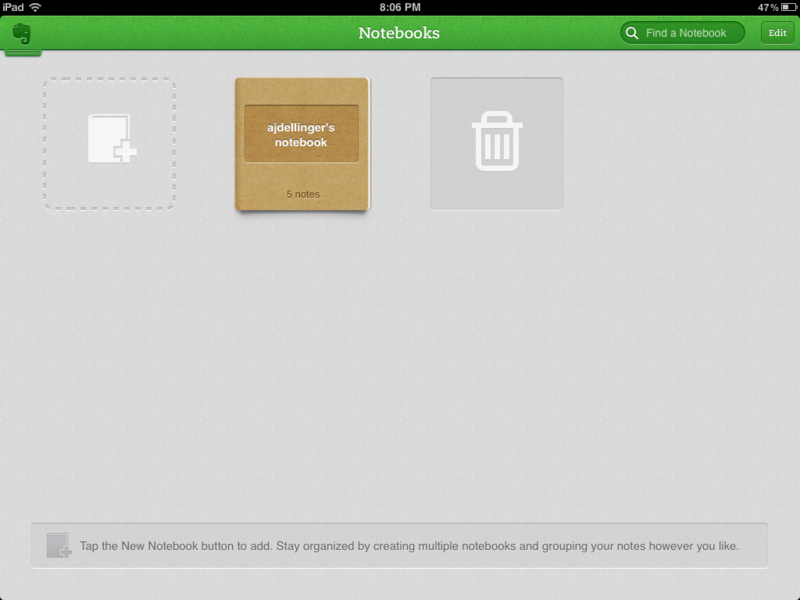 Evernote’s navigation has be flipped and now features a home screen that resembles a filing cabinet. Not the kind of filing cabinet that I have, with mislabeled manilla files falling off the hanger and papers bent and crumbled as they lie misplaced throughout, but like an actual functioning file cabinet. The folders contain all of the notes you’ve created and are accessible in four different ways: Places, Tags, Notebooks, or All Notes. This puts everything right at your fingertips and no less than two taps away. It’s definitely an improvement on the previous approach that worked but was less direct. This system will feel quite natural to most people. The display of notes also takes on a new new notecard style, showing off more information and content than previous iterations. It’s handy when scrolling through notebooks where notes may contain similar content or when there’s just a very quick bit of info that you need and don’t want to dig for. It may be right there on the title card. That said, it would be nice to have some color-coding functionality. That may bring back nightmares of writing out notecards and playing the matching game to study for tests, but it could still serve a purpose in this instance. Notebooks have a new look as well, and now include all of your own notes and any note that has been shared with you. This is great for switching between notes that have been shared for a multi-person project and content you’ve kept to yourself. If you’d only like to view one set of notebooks, there’s a filtered view that changes to your preferred viewing. The notebooks have a moleskine look to them and are shown in neat looking stacks on the iPhone or spread out on the iPad. It doesn’t really serve any benefit, but it’s easy on the eyes. That may make it sound sexier than it is, but you get the idea. A feature lost on the iPhone version but now available on the iPad is Recent Notes. If you’re using Evernote on the iPhone, this may be a sorely missed section. It makes it easy to continue working on a project that you’ve been editing continuously. Without it, you can’t just glace at where you last left off. It’s likely little more than a mild inconvenience, but it’s still a casualty of the redesign. If you’re an iPad user, though, turn all of the negatives of that paragraph into positives because you’ve got the extra screen space to afford a feature like Recent Notes. While some sacrifices were made for the sake of navigation and visual appeal, plenty more have been added in the name of organization and ease of use. The pros of Evernote 5.0 outweigh the cons, and when you combine it when the new version of Evernote for Mac, it makes for one lethal and uniform combination. With it, you can keep tabs on every idea that crosses your mind. Finally, you might remember that great idea for a new . On second thought, use Evernote with discretion. Evernote 5.0 for iOS is available for free in the iTunes App Store.